When an established maritime company announced tentative plans last month to start a new domestic shipping line in 2020 to serve Hawaii, it said such service would provide “market stability.” But another possible result is a cargo capacity glut. A glut could result if the company, TOTE Inc., executes its plan to haul containers on four new ships while two existing carriers, Matson Inc. and Pasha Hawaii, maintain or increase their fleets. Some observers compare the situation to what happened in Hawaii’s interisland airline industry about a decade ago when a third carrier tried to elbow its way into the market in a move that saturated capacity, ignited a price war and ultimately contributed to two airlines, Aloha and go!, going out of business. In ocean cargo transportation, Honolulu-based Matson is the dominant carrier and is upgrading its fleet with four new ships under construction, slated for delivery between 2018 and 2020. Pasha announced in August that it ordered two new ships it expects to receive in 2020 and more recently added that it will keep its four oldest ships viable by making upgrades that meet new federal environmental regulations set to take effect in 2020. That would give California-based Pasha a fleet of eight ships in 2020 available for Hawaii service, up from six now. The likely outcome of this scenario would be overtonnaging in the domestic Hawaii trade, deteriorating freight rates and the withdrawal of one of the carriers. Pasha hasn’t explicitly said it will use eight ships in Hawaii three years from now, but suggesting it could puts a big new variable into the equation of contesting market share. If Pasha adds two ships and TOTE launches four, that would represent a roughly 24% increase in the number of ships, including Matson’s, serving Honolulu from the West Coast — to 21 from 17. Mike Hansen, a local shipping industry observer who heads a group called the Hawaii Shippers Council, said historical annual cargo volume growth rates around 2% don’t support all the planned ship additions that increase tonnage, or cargo capacity. “The likely outcome of this scenario would be overtonnaging in the domestic Hawaii trade, deteriorating freight rates and the withdrawal of one of the carriers,” he said in an email. Hansen also noted that the six new ships ordered by Matson and Pasha have bigger capacities than their existing ships and that the resulting capacity gain including four ships from TOTE would be closer to 50%. Matson, which operates 11 ships now in Hawaii, will replace six older ships with the four new ships without a capacity loss. Matson also will retain reserve ships. Local economist Paul Brewbaker said carriers need to plan for long-term future demand growth, but he questions how overall ocean cargo capacity can feasibly grow much beyond the rate of general state economic growth. Hawaii’s economy is closely tied to shipping, as about 80% of all goods consumed in the state are imported, and 98% of that comes by ship, according to state estimates. Some of these shipped goods arrive on foreign carriers, but Matson and Pasha are the backbone of the industry. How all the positioning by TOTE, Pasha and Matson shakes out is expected to become clearer in the months ahead, especially because it can take three years or so to build a containership. And each ship represents a huge financial commitment. Matson is spending $929 million on its four ships, or $232 million on average. Of the three companies, TOTE has the least certain plans. TOTE, a subsidiary of Seattle-based Saltchuk and sister company of interisland cargo carrier Young Brothers Ltd. and Aloha Air Cargo, announced Aug. 17 that it had signed a letter of intent to order four ships from a Philadelphia shipyard. TOTE’s announcement alluded to Pasha’s four oldest ships facing a deadline to comply with new federal pollution control regulations effective in 2020, and said its intended service would provide market stability. Seven days later Pasha announced it had signed a contract to buy two new ships. After that, in response to a question from the Honolulu Star-Advertiser, Sinclair, the company spokeswoman, said Pasha plans to overhaul its four oldest ships to meet the 2020 requirements. TOTE said its plans are reliant on securing space at Honolulu Harbor to offload containers, and that it has begun discussions with the state Department of Transportation for such space. For more than a decade, DOT has been planning to create a new container yard at the former Kapalama Military Reservation site at the harbor’s Ewa end. The 90-acre terminal would include space for ships to dock, cranes and container storage. Currently, Matson and Pasha operate along piers fronting Sand Island across the Kalihi Channel from the terminal expansion site. Pasha uses Pier 51A and an adjacent container yard. 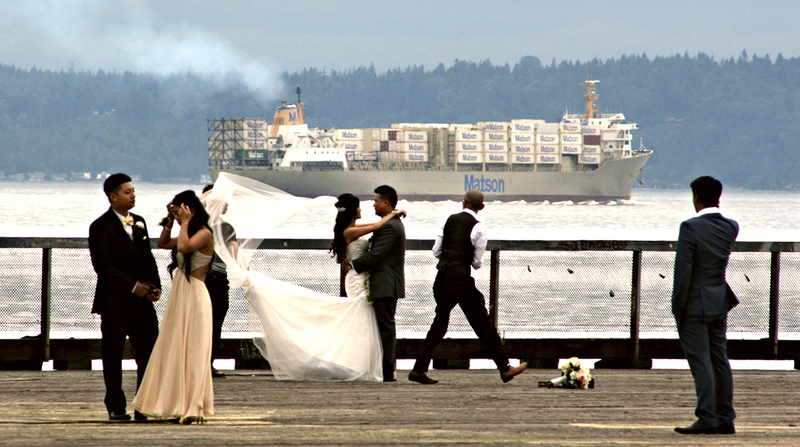 Matson uses Piers 53, 52, 51C and 51B. Under the expansion plan, it was envisioned that Pasha would relocate to the Kapalama site and Matson would take over 51A at Sand Island. The DOT has been unwilling to say whether it’s possible to accommodate three carriers with their stated plans for service.